My client wants me to regroup shops which is defined manually by my client. 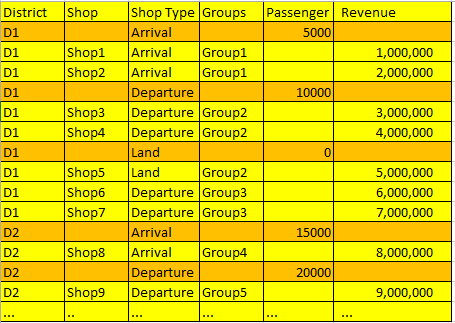 After that this new Groups doesnt have any passenger number as in table below. But my client wants passenger number in each new Groups. In a technical way, max number of passenger which any shops in these district - shop type has. How can I solve this problem? OR How to reach Second table as in picture2 from first table ?